A 24 page eBook explaining how to prepare and work with your self-help session, and three MP3 recordings: Introduction, Preparation Instructions, and a Guided Session with the Dalian Method. 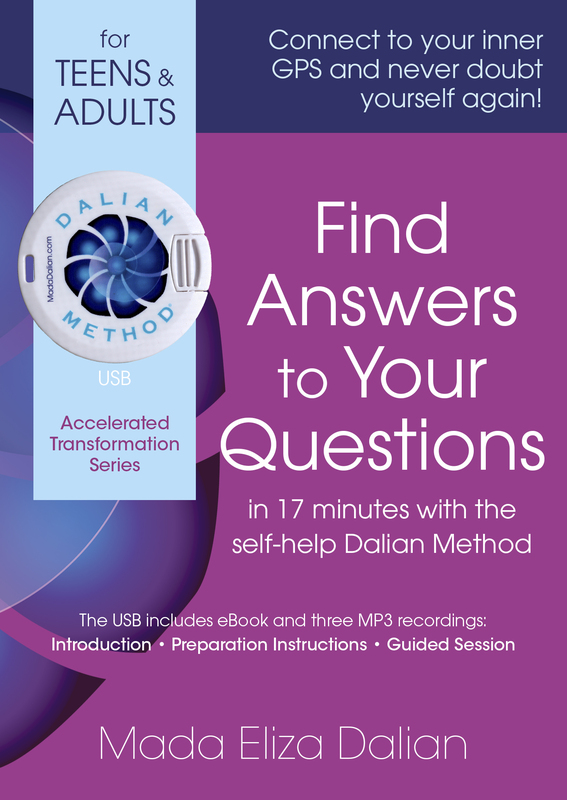 Find Answers to Your Questions is the first release from the Dalian Method Accelerated Transformation Series™ It is a practical self-help tool for adults and teens. In just one short session, and without the need to use the mind to figure things out, you can connect to your inner GPS, find answers to your questions, make clear life decisions, and never doubt yourself again! Find Answers to Your Questions session can be used for anything, be it health, decisions you must make about school, work, career, relationships, or simple things about your daily life situations. Use Find Answers to Your Questions session to de-stress, eliminate your insecurities and self-doubt, learn new things about yourself, get clarity about your relationships, worry less, begin to trust yourself, and feel confident about your choices. “Find Answers to Your Questions is phenomenal. I call it the link to the ‘Genie in my Belly.’ Ask and you shall receive. It is as easy as that. I have used it to get any answer, something as simple as choosing the colour for my hardwood floors, to a deep question as to why I do feel so alone at times, or what should I do to resolve a conflict with a friend. When the answer arrives, it is a deep knowing. Wow, what a unique way to quickly connect to our intuition and get answers. It is so self-empowering and liberating, and it has helped me transform my life. Thank you Mada, you are a genius for creating this mystical tool. Find Answers to Your Questions is going to help humanity evolve rather quickly, by shifting gears from confusion to a deep knowing on anything we need answers to. “When I use the Find Answers to Your Questions self-help session I can skip long hours of searching for answers with my mind or asking for opinions from my friends and family. This magnificent tool saves me time from staying in a circle of duality created by my mind and quickly find true answers inside. Brilliant! Mada shines her brilliance once again with the 17 minute Find Answers to Your Questions. An incredible tool to have in your back pocket to help with the daily decisions we struggle with in life. A tool to quickly look within and see that the answers are already inside us! “I am familiar with the depth and power of the Dalian Method since I’ve been using it for several years now. Find Answers to Your Questions is excellent for the times when I need to make a decision or want clarity on a situation. In just 17 minutes I am able to release any mental or emotional charge that is getting in the way of my intuition, connect to my soul’s wisdom, and find the answers that I would have not been able to find with my mind. I highly recommend Find Answers to Your Questions to anyone who is looking to get clarity about their life challenges, make important decisions, or connect to their inner vision and wisdom. “I have been working with the self-healing Dalian Method since it was released in October 2014, and it has transformed my life! The newly released Find Answers to Your Questions is another powerful tool that I use often. This short 17 minute session assists me to cut through my insecurities and doubts and quickly access the true answers that are hidden in my being. I diligently follow the answers that were revealed through action steps that Mada recommends to take after the session. Surprisingly, I get even more clarity about the situation when I put my answers into practice. Thank you Mada for this revolutionary tool! 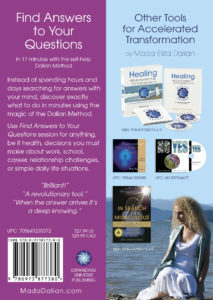 Since the release of the full (90 minute) and the abbreviated (70 minute) versions of the Dalian Method™ (DM) in Healing the Body& Awakening Consciousness with the Dalian Method: An AdvancedSelf-Healing System for a New Humanity, many people have been asking me to create shorter versions of the method so that they can easily incorporate it into their daily life. 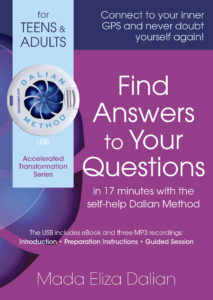 Find Answers to Your Questions is the first in the Dalian Method Accelerated Transformation Series™ that can be used by teens as well as adults. 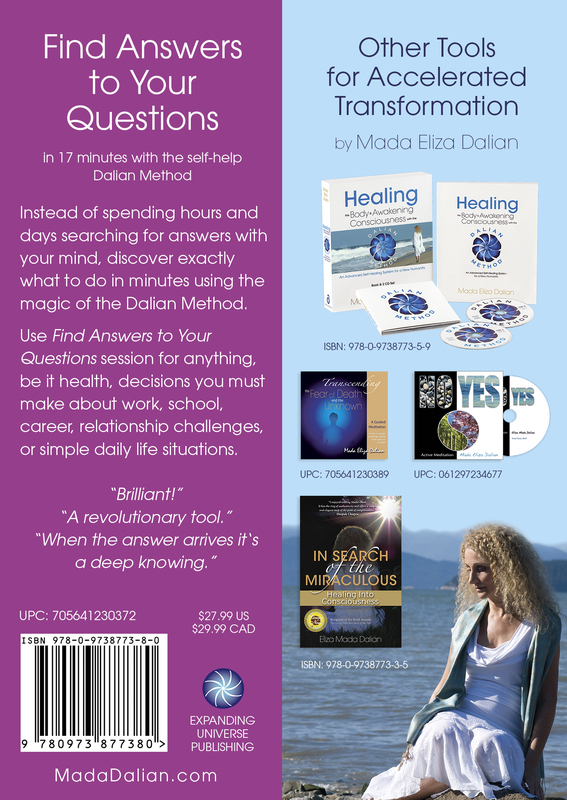 Other variations of the Dalian Method will address and transform specific issues such as stress, fear, anxiety, separation, depression, self-judgment, self-doubt, chronic pain, relationships, school, work, career decisions, and so on. For dealing with more complex issues I strongly recommend starting with the full 90 and 74 minute versions of the self-healing Dalian Method. This does not mean, however, that you cannot start with the short versions of the Accelerated Transformation Series and then move on to using the full versions. I also recommend incorporating the full versions of the Dalian Method every now and then, especially when life provides you with opportunities disguised as challenges. For those who have not yet used the Dalian Method and are not familiar with its main components, please make sure to practice with the Preparation Instructions outlined on pages 8-11. You can also practice with these instructions by listening to the MP3 recording included in your package. I hope that Find Answers to Your Questions will help to save you time and heartache and will open the door to your inner wisdom where all the answers are eternally present and waiting for your discovery!